We presented the data, and it didn’t look good. Engagements were down and cost per engagement was up. After three months of running the creative, we had exhausted the audience pool. There was no one new left to talk to and we recommended the client pause the program until new creative was ready. We knew what would happen. All of the data pointed to the same outcome: he was going to throw away good money running creative that had very little chance of leading to a conversion. Money that could have been more wisely spent somewhere else. Unfortunately, this is a true story. And one that has been repeated over and over again by marketers who are afraid to kill their underperforming marketing activities. I myself have been in that situation; so far into a project or program that pulling the plug seemed like giving up. As marketers, we’re often stuck with a program or creative that isn’t performing in the way we had hoped, but we keep holding on in the hope that it will prove worthwhile in the end. This is known as the fallacy of sunk costs. Phrases like “But we have so much invested…” or “We need more time…” or “If we just make this minor modification, it might work…” are all precursors to making a decision based on past costs. But when we focus on past costs rather than future utilities, we fall victim to the fallacy of sunk costs. Psychology Today refers to it as “backward looking decisions,” and it occurs more often than it should. Why Is It So Hard To Admit It’s Not Working? In some cases, we simply don’t know when to make the call. If we have not clearly defined our goals, then we have no way of knowing if we have accomplished them or have fallen short. Setting well-defined goals, and measuring and reporting on them, provides clarity as to when it is time to pull the plug on an underperforming program or on a program that is starting to show diminishing returns. Without well-defined goals, the assessment of a program becomes a matter of opinion; a gut check. Often, our decision to keep moving forward with something that is either not successful or has outright failed is because we are hoping to recoup our initial investment. But if we are not seeing a return with the current creative or program, and we don’t change anything about it, why would we expect to see different results? Albert Einstein said that doing the same thing over and over again and expecting different results each time is the very definition of insanity. Countless psychological studies have reported on the endowment effect, which says people attribute value to items simply because they own them. Our inability to let go of underperforming marketing activities is directly related to the ownership we feel over them is particularly prominent in Western cultures. In fact, in a 2004 paper by California State University, Sacramento Professor of Marketing Gail Tom found that “the endowment effect was higher for goods that are associated with self.” Given the blood, sweat and tears (and countless hours of copywriting and proofs), is it any wonder we have a hard time letting go? Despite having clearly defined goals and knowing that the activity or tactic isn’t working, we are still afraid to pull the plug. This is because we are afraid that admitting the marketing activity is a failure means that we are a failure. And no one wants to look like a failure. This reason is the hardest to overcome because it is personal. It is personal because we, and the organization for which we work, associate the success of our marketing programs to our own success as marketers. But what if we could change the conversation so the shift in direction is viewed for what it is – a strategic move that uses brand resources in the most profitable and efficient way? 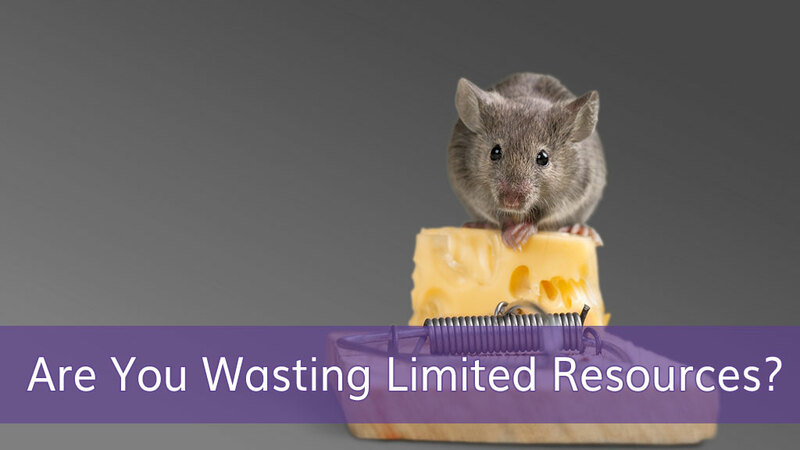 There are two things that are true to almost every business: (1) we have limited resources, and (2) we don’t want to waste money. By moving away from short-term, immediate gratification to a more strategic and long-term approach, we can address both of these issues while also demonstrating our value to the organization. We all have limited resources, whether it’s time, money or both. By acknowledging this and taking ownership of our ability to control our limited resources, we have the ability to maximize the effectiveness of our marketing efforts. When we stop an underperforming campaign, we free up resources so that we can try something else that may work better. Setting realistic expectations actually makes it easier for us to do our jobs as marketers. There are a lot of variables, and we cannot be right every time. At some point, we are going to fail. If we have not set up a realistic expectation that a marketing activity or tactic is unknown, other people in the organization will expect it t0 work. When it doesn’t, we are seen as failures. However, if we set the marketing tactic up as an experiment, then that “failure” becomes an insight that can be applied across marketing practice, and maybe even the organization as a whole. Better yet, if we run the experiment on a small scale before implementing it on a large scale, we gain data to support our recommendation. Now that we know what to look for, how do we ensure that we do not fall victim to the fallacy of sunk costs? By ignoring the emotional attachment to a program and letting the data speak for itself. We do this by relying on our data. If you are still not sure it is time to stop a marketing tactic, campaign or program that is not meeting your needs, just use our handy, dandy decision tree. Rather than being concerned about justifying past practice, we must look for opportunities to benefit future activities. When you are evaluating the viability of a marketing program, the amount that you have already spent on it should not be taken into consideration. If we let unrecoverable costs influence our marketing efforts moving forward, then we have set ourselves up to fail. Instead, let the data indicate when a tactic or program has run its course. And when that point comes, don’t be afraid to make the right decision and kill the underperforming marketing activity. 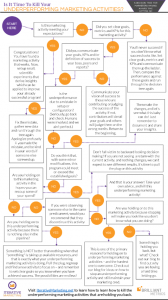 For a quick-reference, download our Marketing Activity Decision Tree. We help you see if it is time to stop your underperforming marketing tactics in an easy-to-read worksheet.